Don't get stuck in a rut for 2015, just like you set professional goals, set some new personal ones too! Single and ready to mingle? Maybe a switch up in appearance is what you need to help cupid along while you are waiting to get hit by the love arrow! I have been on a sort of 'personal renaissance' myself, I chopped off over 13 inches of hair last year to donate to women with Cancer (read up on my experience if you missed it HERE), next up for me a color change for my hair which I have never actually done but really want to try (and NO there are no grey hairs on my head yet, this is just for FUN), and I started the first week of the new year by shopping my closet, tossing stuff I have entirely outgrown and getting ready to make some wardrobe changes. Starting with new foundation, because you can buy great clothes but if the undergarments aren't holding what they should hold, the clothes won't look right! While I love my new shorter 'do', keeping those layers looking 'styled' definitely requires a good hair spray, but I don't want sticky helmet head, so I'm digging the new Biomega Freeze Baby Mega-Hold Hairspray by aquage to keep those layers in place on these cold, windy and inclement winter days on the East Coast! I love the smell of FRESH Roses. And yes I meant to capitalize the word Fresh, one of the reasons I tend to not be attracted to many perfumes is that the rose scent used is highly 'synthetic' or overly concentrated and over-bearing, at least to my nose. 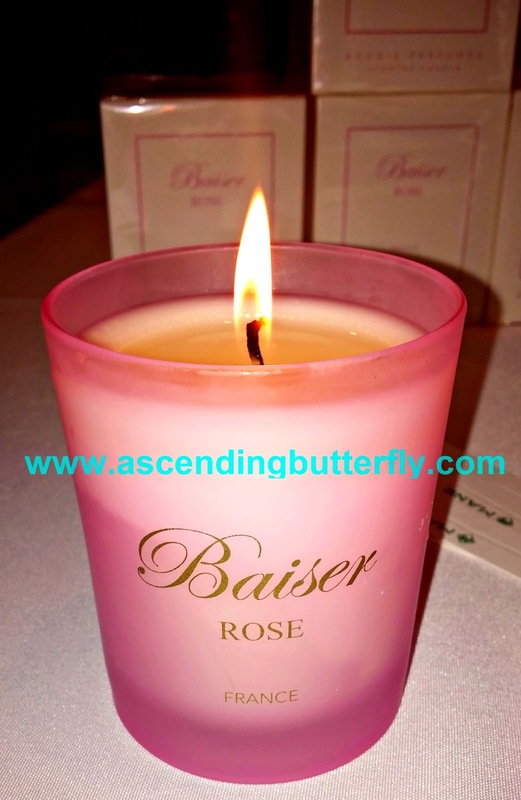 I was surprised to find myself taken with the Baiser ROSE Candle, I'm rarely such a frilly, girly girl type, but this very pink, rose-scented candle was a delight to the senses and I really like it! Definitely another Score as a Valentine's Day Gift Idea! 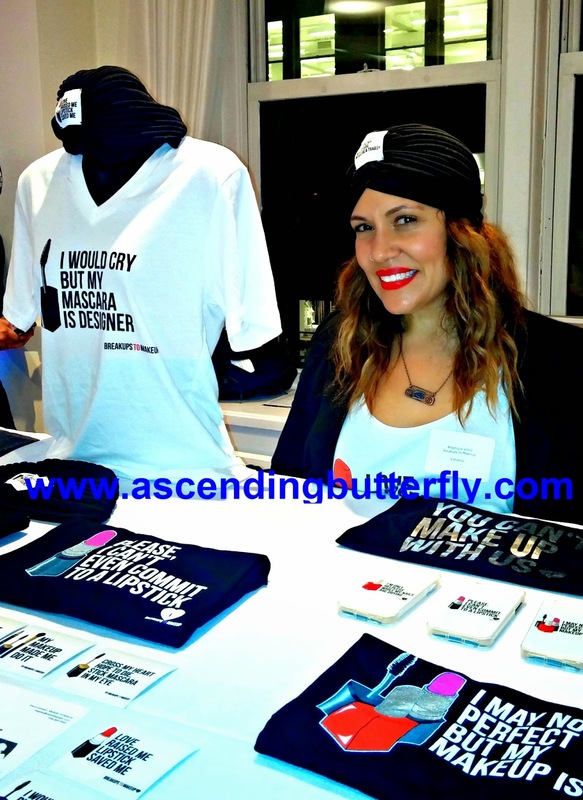 Breakups to Makeup is the creation of makeup artist Angelique Velez (pictured above) as a staple of self-expression for the person whose heart was broken and buried themselves in the darkest of places, to the cancer patient who has lost all her hair yet finds comfort in that perfect shade of lipstick, a brand for those with a genuine love of makeup, their fashion and accessories are just plain spot on! See the t-shirt next to her? It reads "I would cry but my mascara is designer' - I know I am not the only one yelling YAS! and YES! or the makeup bag that reads "I May Not Be Perfect But My Makeup Is' - If you plan to 'give good face' this year, then this is EXACTLY the brand you want to do that with! I wish one of their T-Shirts or Cosmetics bag were in the Swag bags, but sadly they weren't or you would see a picture of me wearing it! 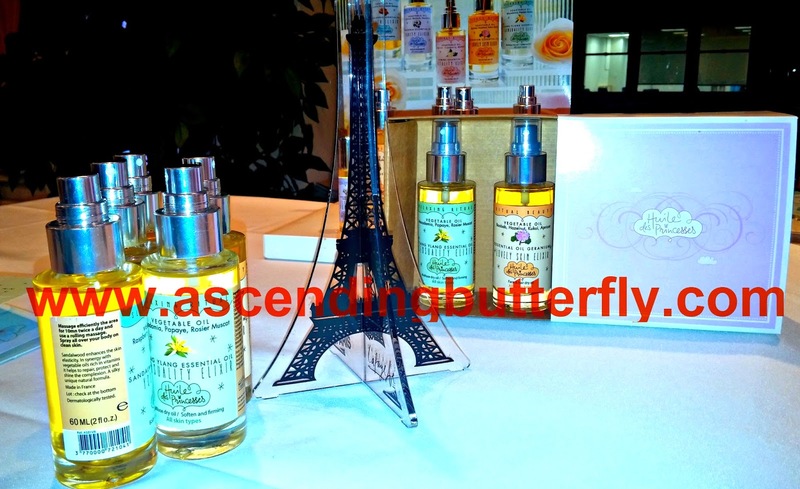 If a trip to Paris is on your bucket or New Year's resolutions list but for whatever reason you don't think this is going to be your year either, try Huile des Princesses a new aromatherapy line with all-natural precious oils for face, body, hair and massage on for size. A little bit of Paris luxury for your home spa. Maybe not a trip to Paris, but your skin will think it has been there at least! Founded by a multi-spa owner, Intelligent Skin Sense uses a very holistic approach utilizing botanical herbs and clinically tested ingredients to make beauty products and tools that help you bring the spa experience home. Sense a theme? Why not make pampering yourself one of your top priorities for this new year butterflies? I would love to try out the Micro-Current Home Facial Device, I have never tried one of these before and have often wondered about their efficacy. If any of you have tried them please let us know what you think! K6 Skin Care, founded by Dallas based naturopath Sharon Krahn, her combination of enzymes, herbs, essential oils and nutrition led to an organic skin care line that is safe for ALL skin types especially those with hypersensitive skin. This Gel Manicure with Nail Art courtesy of Primp and Polish (linking you guys to their twitter handle as the website was down when I sat down to write this!) is just plain EVERYTHING! Looking back at it just makes me happy. Look at that vibrant nail polish and that 'deco-inspired' Nail Art! This lasted well over a week for me and while Gel is a bit harder to remove than traditional Nail Polish, the long lasting brilliant look is worth the extra time and steps in my opinion. They have 3 locations in Brooklyn, New York! What happens when a group of cosmetics-crazed science geeks from MIT join forces? Wink Natural Cosmetics an all-natural solution to help promote eyelash and eyebrow growth in dormant hair follicles. While some growth serums, can boast giving you longer eyelashes, they can still be sparse, just longer and sparse, what Wink does is make your lashes AND brows thicker and fuller too! 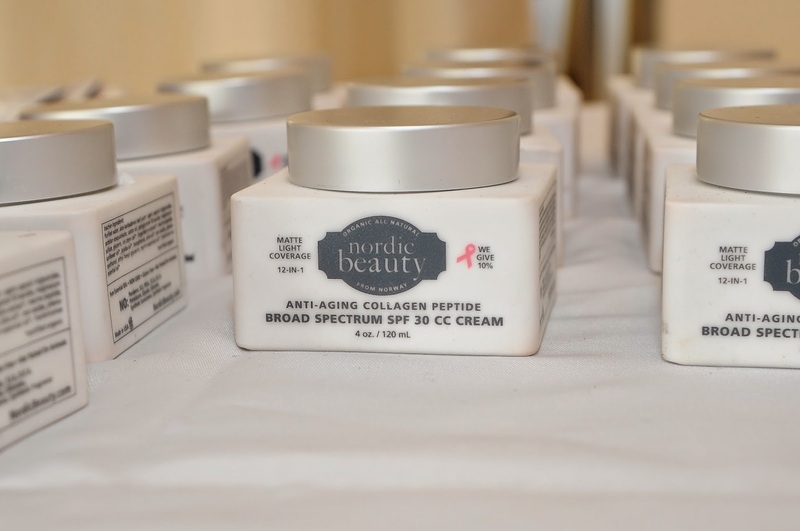 Nordic Beauty is a natural and organic skin care line that utilizes Marine Collagen Peptides from Norway, it is a combination of Science, Marine Collagen Peptides and cold Norwegian Sea Water. 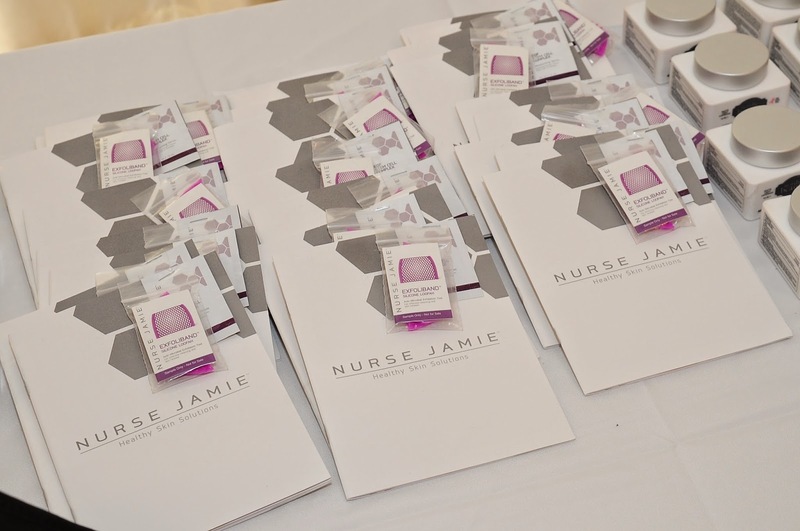 Jamie Sherrill, R.N., "Nurse Jamie" is the owner of Park Medical Spa in Los Angeles and Abu Dhabi, she is a registered nurse and global skincare expert with quite a list of celebrity clientele who love her healthy skin solutions, cutting-edge products and medical devices. She also offers skincare regimens for MEN, not just women! That's right my male butterflies, this is the year to kick your grooming habits up a notch too! 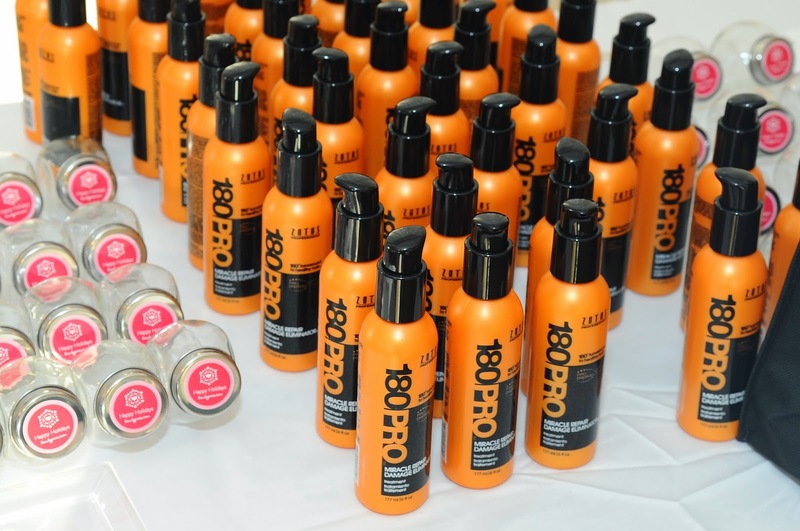 I actually got to meet the Zotos 180PRO team at the summer Beauty Press (held on a Luxury Yacht in Manhattan, if you missed that recap click HERE), the anchor in the line (oops no pun intended after the yacht reference I swear!) is the Miracle Repair Damage Eliminator Treatment which uses a patent pending cross-linking ingredient to attract the reparative benefits of 180PRO products to the damaged areas of your hair like a magnet, to repair up to two years of hair abuse and safeguard your tresses against future damage. I tend to blow out and flat iron my hair often, so this is literally made for me! 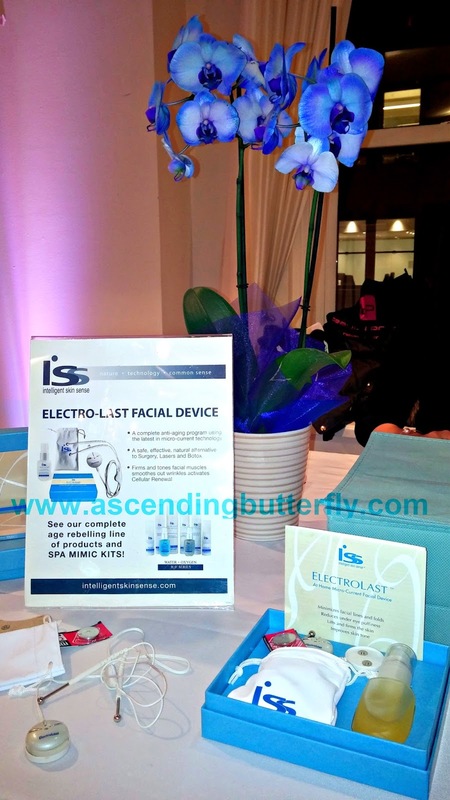 I was stoked that Beauty Press was actually able to squeeze in another event just before the holidays! I loved to see that 180PRO returned as my hair is really responding their products, and there were a ton of new to me products, and as I go along road testing them I will provide individual reviews. (I only test one system at a time so I know what is actually working for me, takes me a bit longer, but I test systems individually and finish them completely/empty the tube so I can give you an accurate review and pinpoint exactly which product is giving me results. I fell in nail love with my mani with nail art so I will be doing more Gel Manicures on these pages this year that's for sure! Although I will say that KISS Products pop on and pop off nails are still a particular fave of mine for speed, ease and convenience. 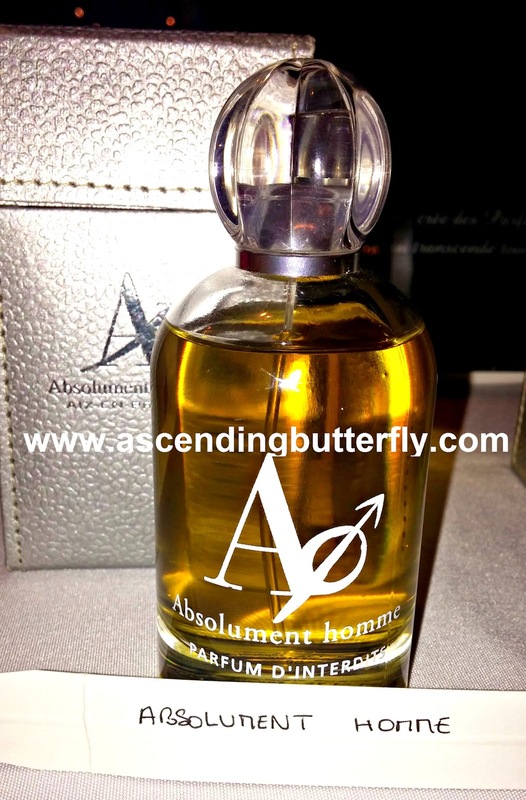 Wonder if it's too much to ask of Cupid to be sure that the man that comes trying to sweep me off my feet is wearing Absolutment Homme? I love the idea of a rose scented candle that REALLY smells like a fresh batch of roses. I can't stand it either, like you said, when they smell artificial and awful. @Mary I'm with you there, it is so hard to find a good rose-scented perfume, and since I tend not to wear those fragrances on me, I like the idea of having it in a candle format instead! What a great way to learn about new beauty products. It sounds like there were a ton of good vendors there. @Masshole Mommy - Beauty Press is a network so even if you are not based near where the events are held, you should register, as they also connect Editors with brands and provide very informative information on both their network (to see the press releases on the network website or receive the newsletters you must join) and they are great about keeping us informed on new products! I would love to try the Nordic Beauty product line. I have decided to let my hair go gray. I have long hair and it is growing out. When my hair reaches a length I can cut it off - I plan to cut off my long hair and be totally gray. Scary!!!! but something I want to do! @DeDa Studios - Please consider donating the hair if you can when you do opt to cut it! Going totally doesn't have to be scary, just maintain it well so it can stay a true grey and not 'yellow', use sulfate free products to maintain your hair and you will love the way it looks! We would LOVE to see a picture when you do, so please tag us! Definitely would get me out of my beauty rut! Tons of great products! Thanks for sharing all of these great products. I'll be forwarding this on to my girlfriend. @stevebethere - Visiting your site is one of my favorite parts of the WW hop! I have a good feeling this is going to be a 'newyeartastic' year for all of us! Carpe 2015! These all look like great products!! I like the candle best. @Kay - Definitely a great pick! I'm a candle person so I am always excited to find a really good one, I'm also enjoying the candle for Philosophy's Amazing Grace right now too! I would love to attend an event like this. I need a swift kick in the mascara as well. The manicure is adorable. 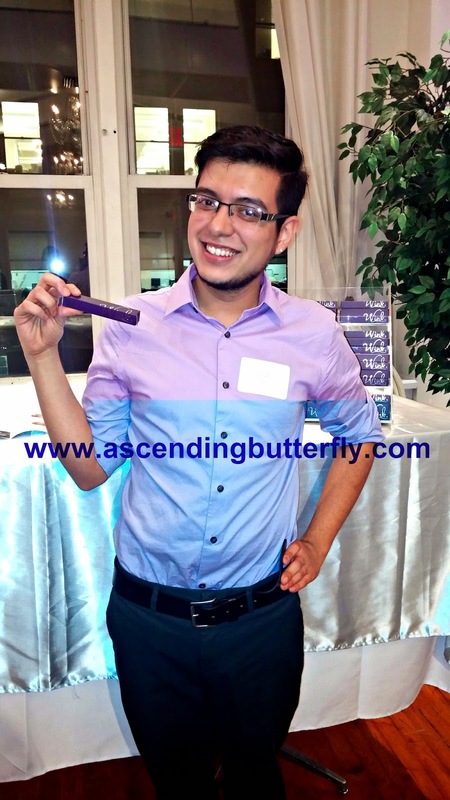 @Rowell Reviews - You can register for Beauty Press even if you don't attend the live events, they give you access to the Press Releases and brand contacts! I was hesitant to try out Gel before that, but not anymore! @Big Happy Buddha - I am intrigued by the device also, they didn't demo it at their station, so I will follow up with them and find out if I can test drive one. Glad you liked the recap! I always have to be careful of the scents I wear because of my allergies. I guess I am kinda stuck because of that. Allergies can be so limiting! What a great event! I live in the cold too, and I love that you found a hairspray that works great in such an environment, but doesn't give you icky sticky helmet head!! @mail4rosey - As I had my hair so long for so many years I wasn't in the habit of keeping hairspray in stock, but now that it's shorter I tend to want it to keep hair in place and that helmet head thing is a huge pet peeve of mine. Not to mention years ago I saw someone light their hair on fire once because they overdid with the hairspray! YIKES! I love how great the nails look. The blue is such a great color. There are some great products here id love to try. This is such a cool event. I'm afraid I don't change my routine enough. I definitely get a little boring. @Six Time Mommy - I love that Beauty Press tends to work with brands that offer more Natural and Organic Skin Care which is better overall for your skin! I like to check out make up tutorials on You Tube in addition to the Beauty events and tradeshows to find products and style tips that fit into my lifestyle. I do love trying new makeup, and you have a lot of great options listed. I totally want to change up my look this year, but haven't decided what direction I want to go in yet. @Theresa - Keep it as short as possible, if you have strong eyes than focus more on the lip and a light foundation, if your eyes are smaller, play those up and then keep the lip simple like a medium pigment gloss instead of a lipstick. We always think we have to have a longer makeup routine than we actually need for daily wear! I need to take more time with my beauty products and try new products. I also love the candles from Braiser, I bet they smell amazing. @Chrystal - You are NOT alone! Eye shadow tends to confuse many women, finding that balance so you accentuate your eyes without too much pigment is an art! Check out YouTube tutorials, when you hit on someone who shares a look you like, watch their tutorial on a portable device so you can follow that person step by step and imitate the look, once you master what accentuates your eyes, you can then experiment. Some brands even do the work for you, buy the palette that says it's for your eye color, there are palettes for brown, green, blue and hazel already set up with the crease, brow bone color etc so it's one, two, three! You're right there's a huge difference between the fresh roses smell and the bottled perfume you usually get. I like the fresh scent too. The other is too heavy. @mail4rosey - Rose scented anything that really smells like the real deal is usually hard to find, some extracted pure oils that you blend into a beauty product yourself is sometimes better! I am also loving Philosophy's Amazing Grace Candle so if you are into candles, check that one out too! What a neat press event. I'm so loving that Biomega Freeze Baby Mega-Hold Hairspray. I really would love to try it. @Jinxy and Me - I love when you don't have to sacrifice good hold so you can still have totally touchable hair! Wow lots of neat stuff. Awesome event .